The NHLPA Goals & Dreams fund and Lundqvist presented Frölunda Hockey Club with donation of 60 sets of equipment during the Rangers Assist youth program’s visit. New York / Toronto, August 9, 2016 – The New York Rangers have helped the National Hockey League Players' Association (NHLPA) present the Frölunda Hockey Club with a generous donation of 60 sets of brand new youth hockey equipment. This donation was made possible by Rangers goalie and Frölunda alumnus Henrik Lundqvist through the NHLPA Goals & Dreams program. Presentation of the new Bauer gear took place on Tuesday while the North Rockland Youth Hockey association visited Sweden and the Frölunda Hockey Club on an all-expenses paid international hockey and immersive cultural experience, provided through the Rangers Assist presented by Chase program. "NHL players are always looking for opportunities to help make the game of hockey accessible for everyone,” said Mathieu Schneider, NHLPA Special Assistant to the Executive Director. “Young children on the Frolunda Hockey Club, who might not have had the chance to even lace up a pair of skates, will get the opportunity to try hockey for free with NHLPA Goals & Dreams' donation of 60 full sets of equipment. 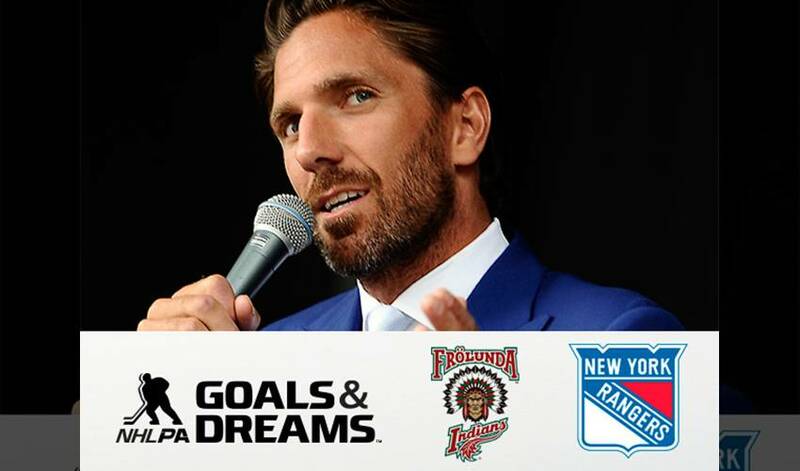 I cannot think of a better type of effort to get behind, together with Henrik Lundqvist, as part of the Rangers Assist youth program's visit in Sweden this week." "This is a good way to promote ice hockey to children and youths,” said Daniel Nilsson, who is responsible for Frölunda’s youth programme. “We will use the equipment donation wisely in order to allow more children and youths the possibility to play ice hockey." New York Rangers Assist, which seeks to improve the youth hockey experience and increase opportunities and accessibility to the sport, held a formal equipment drive contest in the Tri-State area in the winter of 2016. Local Bantam aged (13-14 year old) hockey players were encouraged to enter as a team for a one month collection campaign to benefit local youth hockey players in need. The Rangers and Chase are rewarding the winning team, the North Rockland Youth Hockey Association from North Rockland, NY, with an all-inclusive trip to Sweden, where players will have the opportunity to play in an exhibition game versus the Frölunda youth hockey program, host a “Try Hockey for Free” clinic and much more, all across a five day trip. The tradition of sport bonding parents and their children creates a timeless bond, and NHLPA player ambassador Vinni Lettieri was thrilled to be a part of relaying some very good news to a special father and son duo. Mika Zibanejad (5-2–7 over 3 GP) led the league in goals scored, three of them consecutive game-winners for the New York Rangers to head into their bye week with a win streak. If the winningest coach in NCAA men’s hockey history had the time, he’d gladly take hours to talk about Chris Kreider. Hope. It’s the one message Jimmy Hayes constantly conveys to anyone he meets whose lives are affected by cancer.